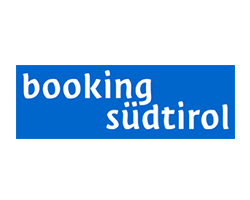 If you would like to spend a pleasant and relaxing holiday in South Tyrol, we warmly welcome you to one of our cozy hotel rooms. Cleanliness and a friendly atmosphere, spaciousness and a pleasing decor are just some of the features of our Tiers accommodation. We offer you rooms in four categories, where you will feel completely at home. We named our room categories after three of the famous Vajolet towers. In the middle of the Rosengarten group, the bizarre rock formations are popular challenges for climbers from all over the world. From your hotel room, you will also enjoy the view of the Rosengarten or the Tiers valley and enjoy the beauty of this unmistakable landscape! 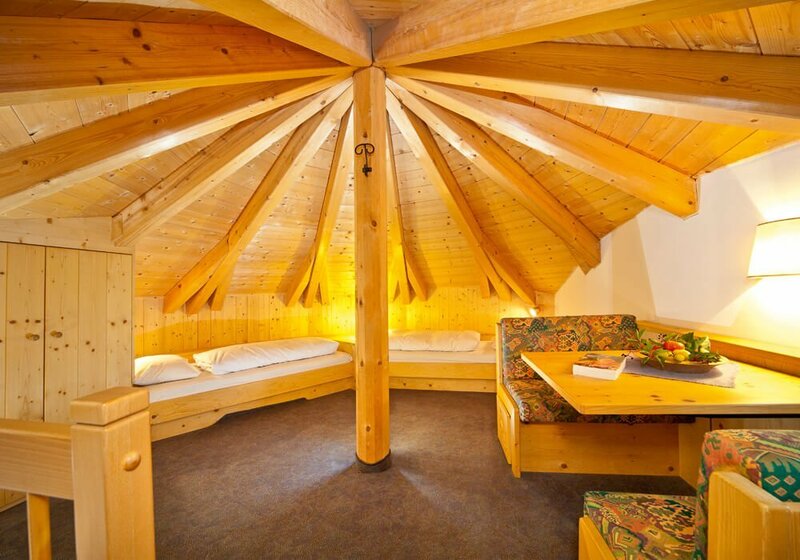 A large, light-flooded double room with modern Alpine Lifestyle flair. The speciality of this room ist the small second floor for cosy moments. The room disposes of a bathroom with large shower, toilet, bidet and hairdryer. A large window wall and a large balcony offer a beautiful view of the surroundings. In addition, the room disposes of flat screen TV, free Wlan, mini bar, safe, desk and a couch which can be converted to an additional bed. A spa bag with cosy bathrobe and towel is provided in the room. Situated at a height of 2790 m, it was first ascended by Hermann Delago on 22nd September 1895 in solo effort. 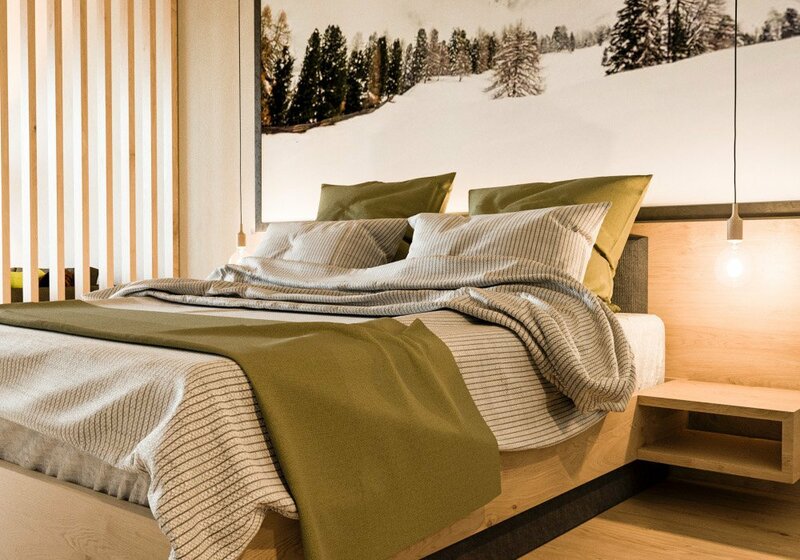 A large, light-flooded double room with modern Alpine Lifestyle flair. It has a bathroom with large shower, toilet, bidet and hairdryer. In some rooms the toilet is separate from the bathroom. A large window wall and a large balcony offer a beautiful view of the valley and the surrounding forests. In addition, the room disposes of flat screen TV, free Wlan, mini bar, safe, desk and a couch which can be converted to an additional bed. A spa bag with cosy bathrobe and towel is provided in the room. The room offers view to the valley. 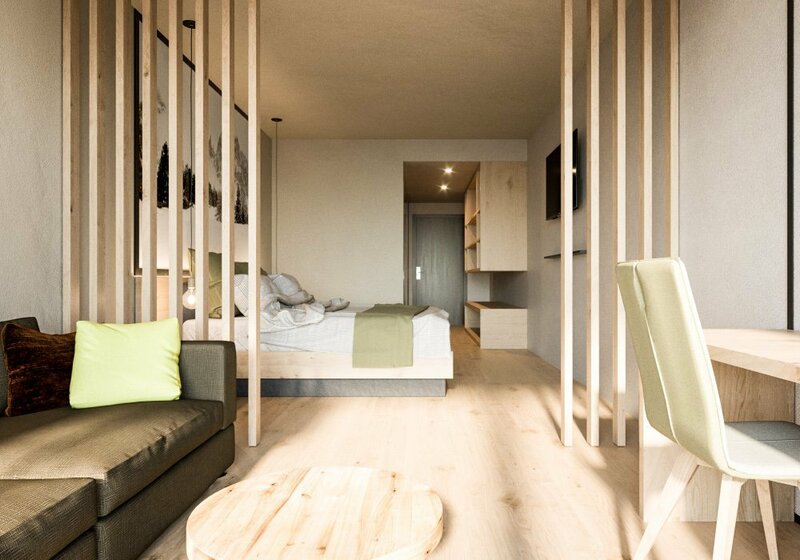 Our new light-flooded double room with modern Alpine Lifestyle flair. It has a bathroom with large shower, toilet, bidet and hairdryer. A large window wall and a large balcony offer a beautiful view of the valley and the surrounding forests. In addition, the room disposes of flat screen TV, free Wlan, mini bar, safe, desk and a couch which can be converted to an additional bed. A spa bag with cosy bathrobe and towel is provided in the room. The room faces to the street side of the hotel. Traditional family room composed of a double room and a small second floor with the possibility of three single beds (perfect for children). The bathroom disposes of shower, toilet, bidet and hairdryer. In addition, the room disposes of flat screen TV, free Wlan, safe and a desk. A spa bag with cosy bathrobe and towel is provided in the room. 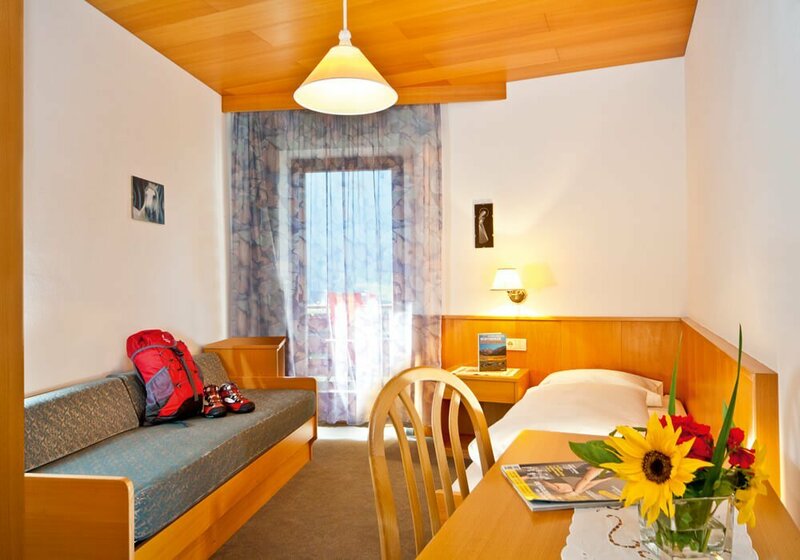 A spacious room consisting of a double room, a single room and a common bathroom with WC, tub, bidet and hair dryer. This family room disposes of a balcony with wonderful view on the mountains, TV, safe and desk. The room offers plenty of room for up to four people. A spa bag with cosy bathrobe and towel is provided in the room. Single room with balcony, flatscreen tv, safe and desk. The bathroom of the double room Tschafon disposes of WC, shower and hair dryer. A spa bag with cosy bathrobe and towel is provided in the room. 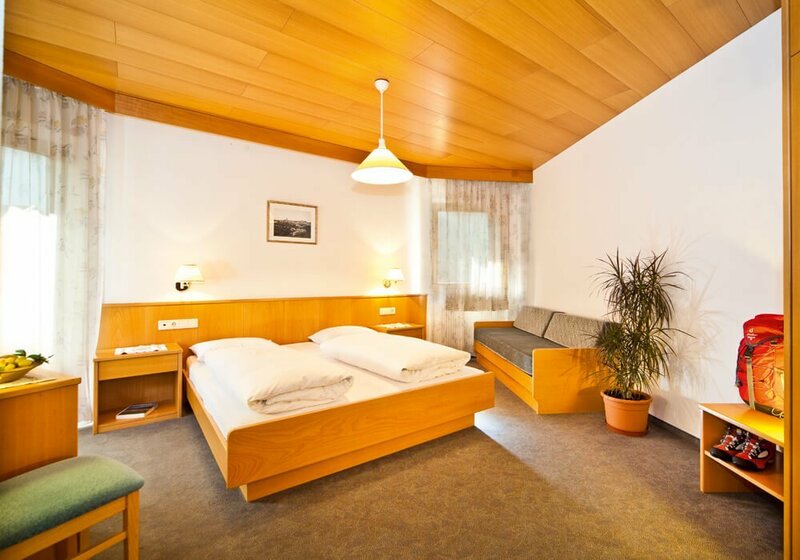 Our room categories Delago, Winkler and Stabeler offer you single, double and family rooms. All rooms have an en suite bathroom with shower or bathtub, WC and hairdryer. 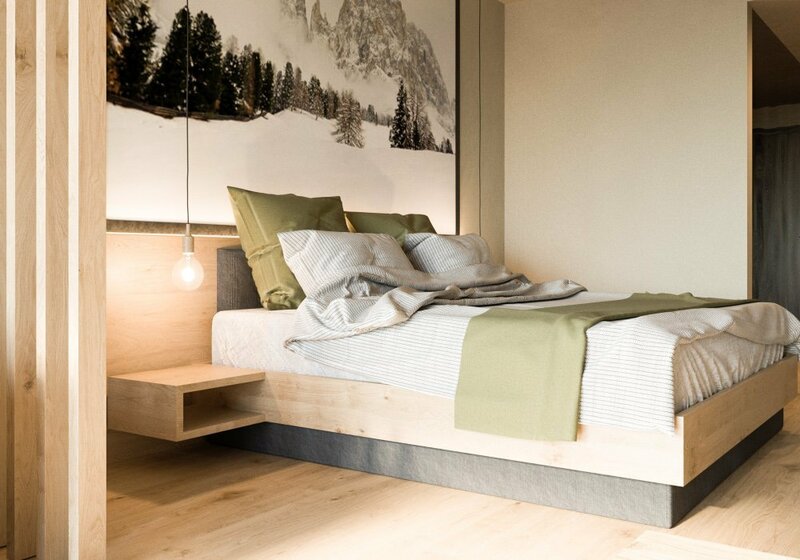 In the guest rooms of the categories Winkler and Stabeler, you can also look forward to a cozy balcony, where you can enjoy fresh air, sun and the wonderful view of the Dolomites right after getting up. 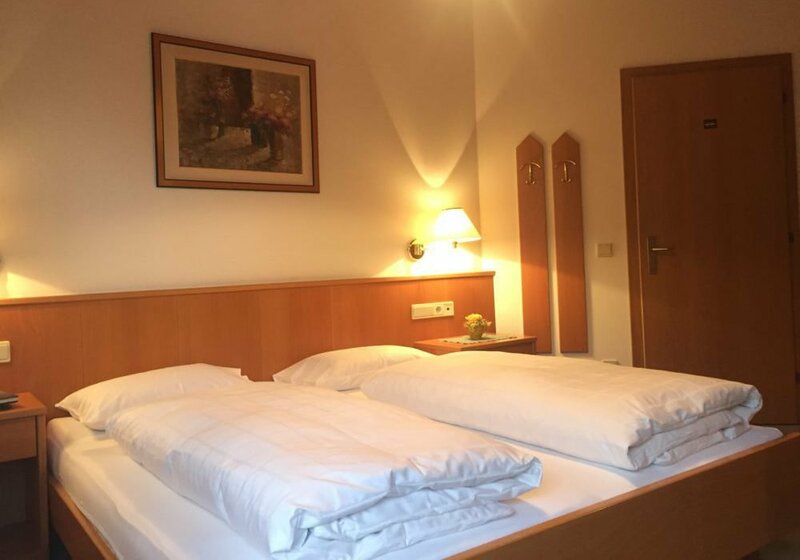 The family rooms in the category Stabeler consist of a double room, a single room or a separate area with beds as well as a particularly large bathroom. There is enough space for three to four people, so you can share an accommodation with your family. If you have small children, which you would like to accommodate in your room, we will gladly provide you with a cot on request. 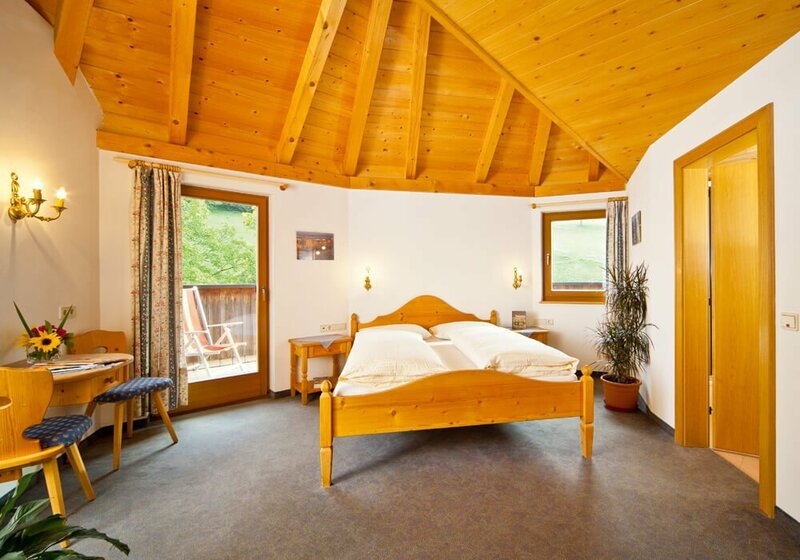 But, besides the guest rooms, there are even more comforts: our dining room as well as our wellness area and our lawn are attended to make you feel at home during your stay at Hotel Vajolet. In the dining room, a rich breakfast buffet is served every morning and a delicious menu is served for those guests who have chosen a half-board. The lawn offers you not only sunshine and a magnificent view, but also an extra: In the pool you can refresh yourself on hot summer days and swim your laps at ease! For a small extra charge, you also have the opportunity to use our sauna area and do something good for your body and mind. 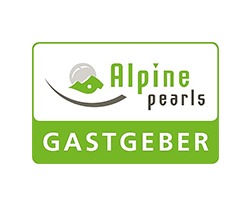 Our guests will be delighted by our offer and the homely atmosphere of our hotel, and we would be very happy to welcome you soon to one of our guest rooms in South Tyrol! All prices are intended per person and day and with half board. Prices shown will attract a tourist tax of €2,30 per person (aged 14 years and over) per day, payable on departure. Cancellations must be in writing form. 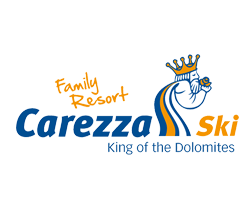 You may cancel your reservation until 60 days prior to arrival without any cancellation fee. If you cancel between 60 and 15 days (included) before arrival, we charge 40% of the agreed total price. 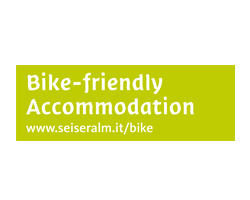 If you cancel between 15 and 8 days (included) before arrival, we charge 60% of the agreed total price. Cancellation less than 8 days before arrival: 100% of the full price. For the purposes of the GDPR, we inform you that your data will be used and saved exclusively for processing your application and will not be disclosed or distributed to third parties. Regarding data processing, you are entitled to all rights according to the GDPR. 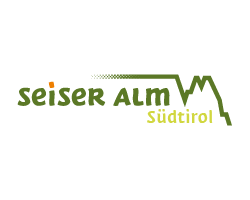 The holder of the rights is Rieder Egon – For more information about your rights, please visit here.